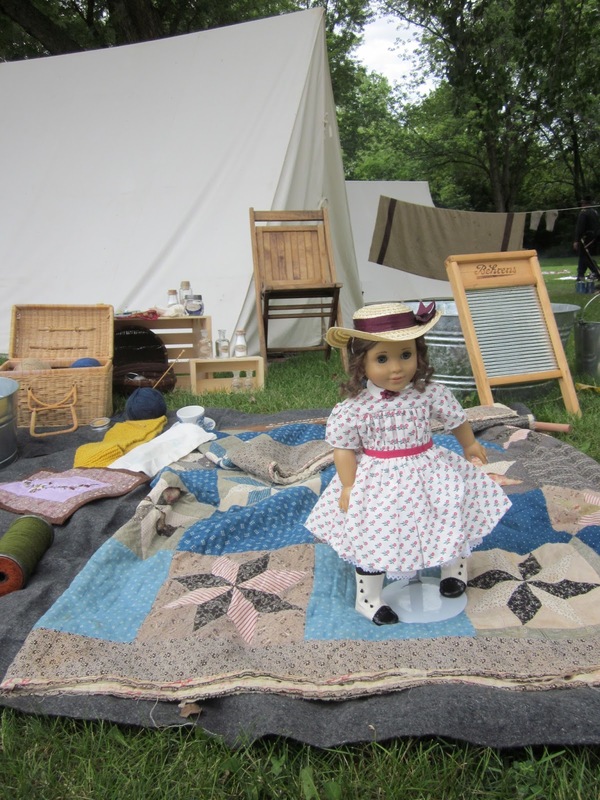 I have been out traveling with dolls but just haven’t set time aside to blog about it until now! 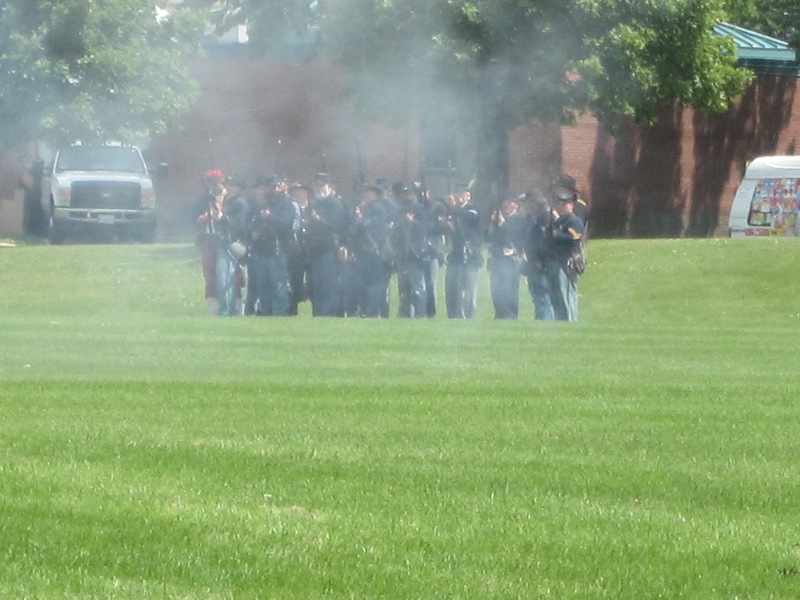 Today I got the chance to see a Civil War reenactment not too far away from my house. 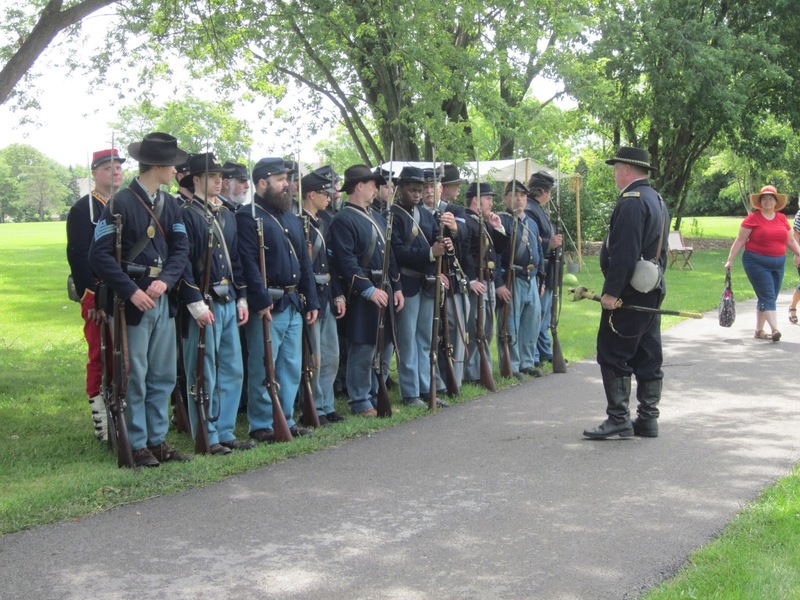 We arrived just in time to see the Union soldiers line up and get ready for a skirmish with a group of the Confederate army. Whenever the soldiers are at rest they stack their weapons. 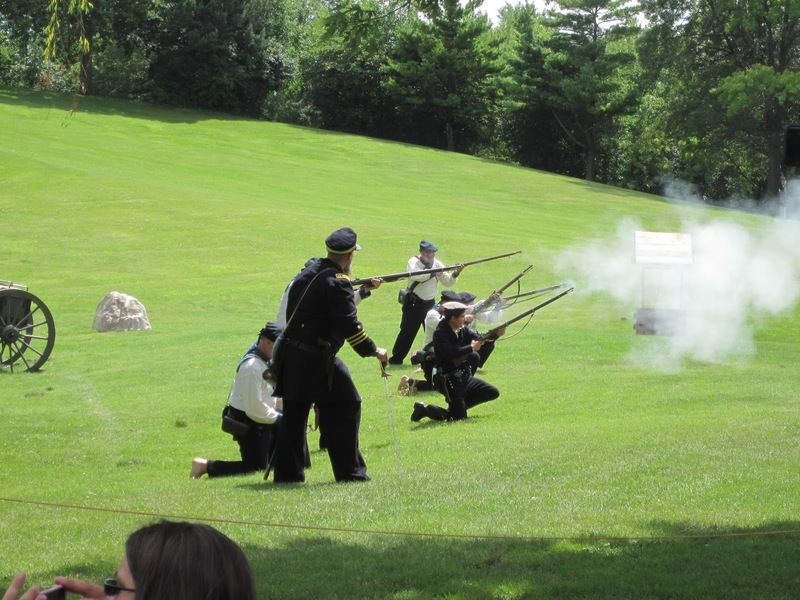 And of course they are stacked in a specific order – by rank and position so they are always able to retrieve their own musket. 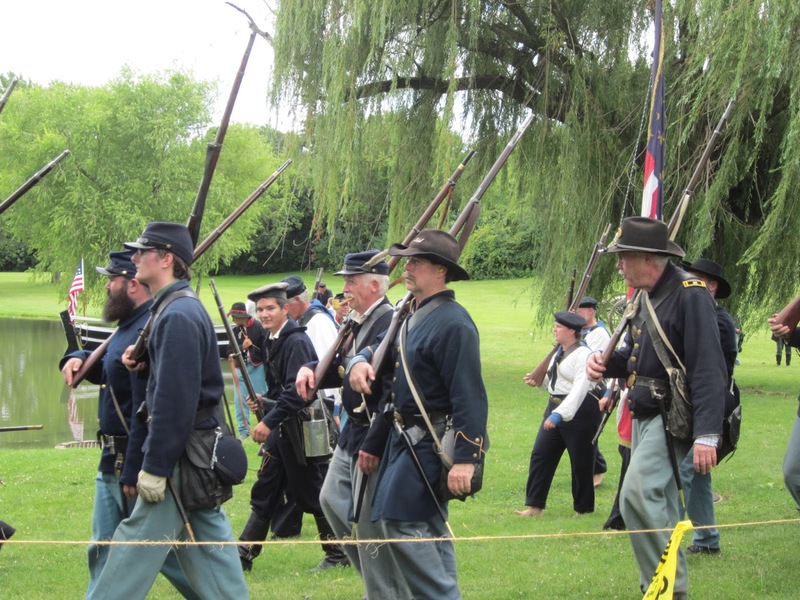 After some discussion that was difficult to hear, they marched out onto the battle field. 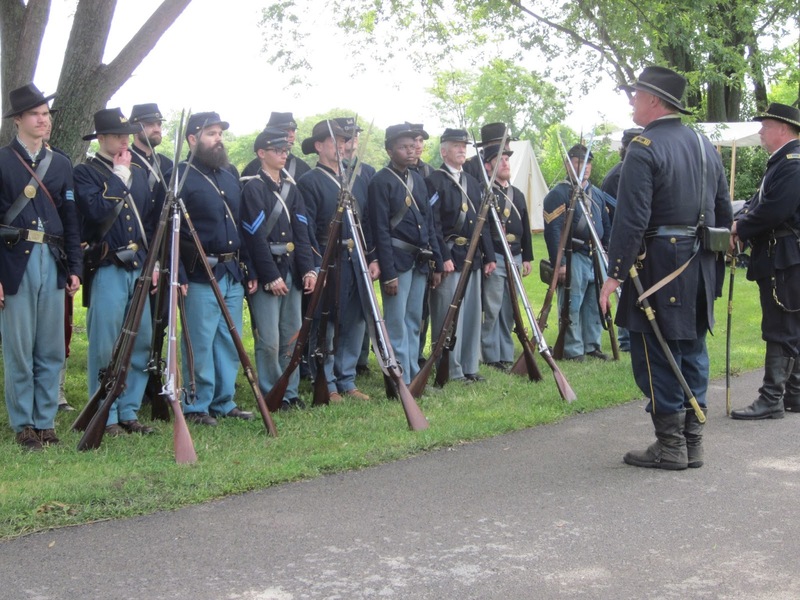 For the majority of the war, the soldiers fought standing in ranks. 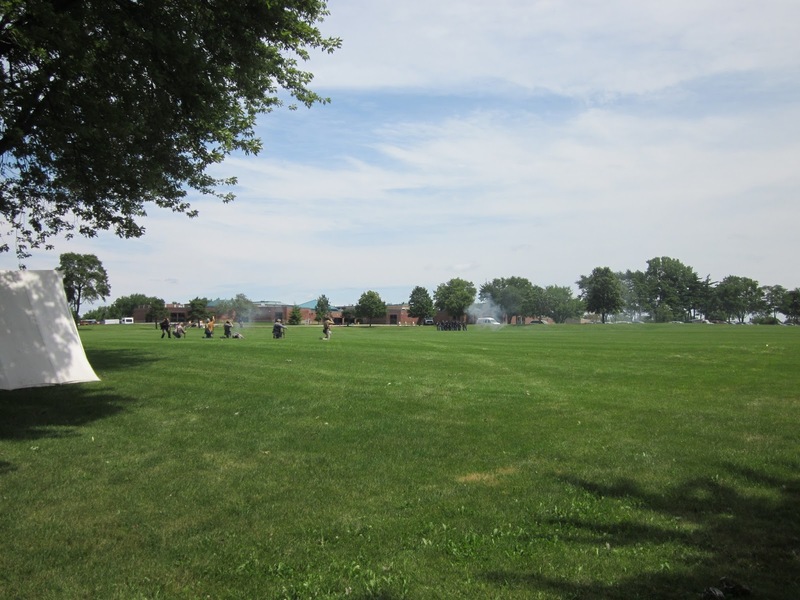 This was done for the revolutionary war, and many other wars before that. This was done for a reason. It’s really hard to communicate and control hundreds of thousands of people without walkie talkies and other modes of communication we have today. 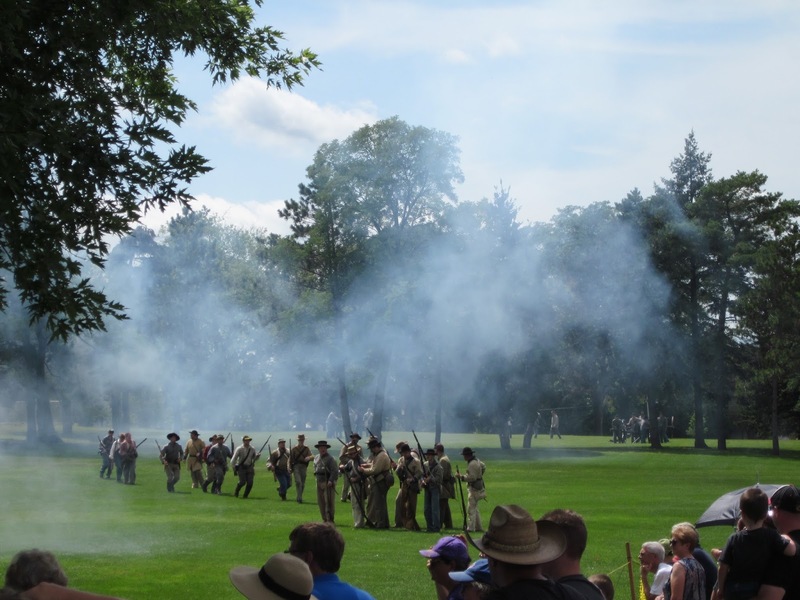 In order to get control and action, the officers had the soldiers stand in lines with drums (and sometimes fifes) giving out battle signals so everyone could hear. 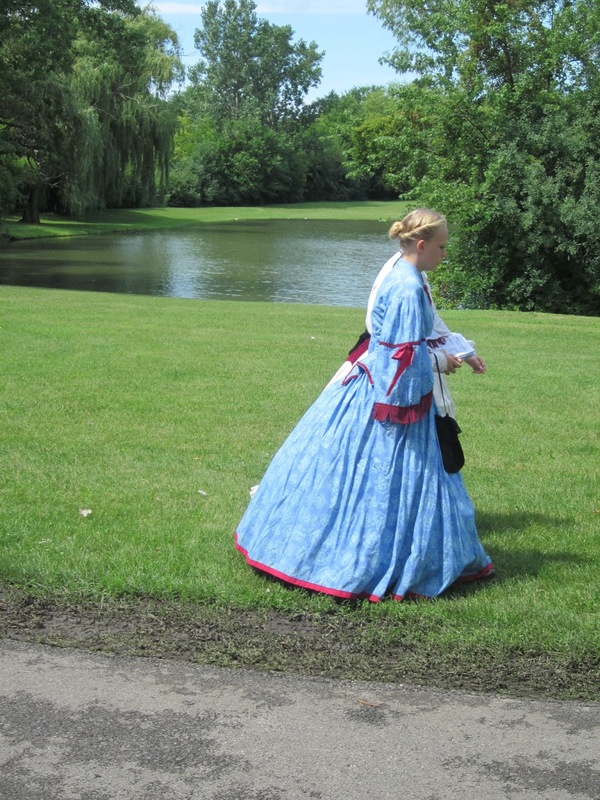 Pretty much everywhere we walked, we would see women in stunning dresses with HUGE hoopskirts, or women wearing work clothes going about their business. These two were dressed up for a ball that was going to take place that night. And these two were by the dog tents getting food ready for the soldiers. (more on the dog tents in a bit). 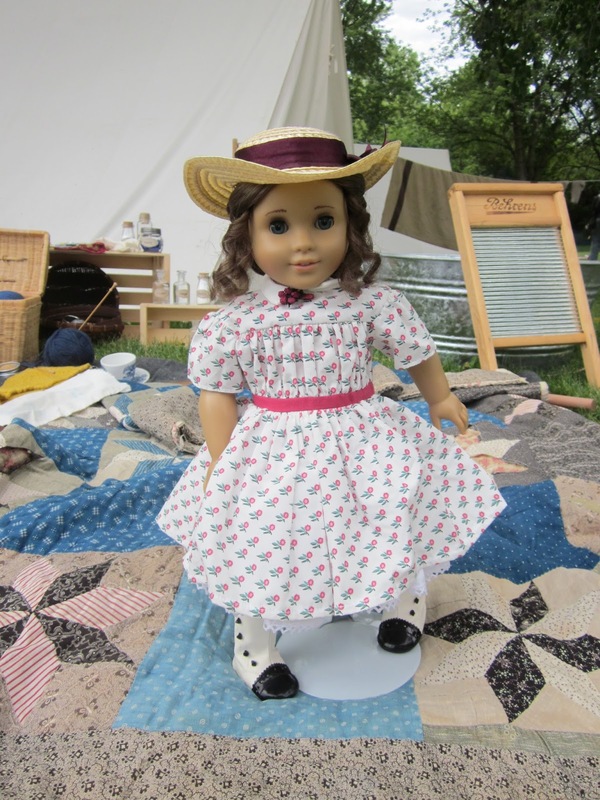 Marie Grace had never been in a battle before, and hearing all the crazy booms, screams and yells, it took her a while to get brave enough to come out of her hiding basket, but she came out to see the laundress’s tent. The laundresses were paid women, either mothers, lovers, or wives of the soldiers, who not only did laundry for the soldiers, but also went out during a battle and tended to the wounded. The quilt Marie Grace is standing on, is a real true Civil War quilt! Actually, it was kind of amazing how much original Civil War stuff we got to not only see, but touch too! 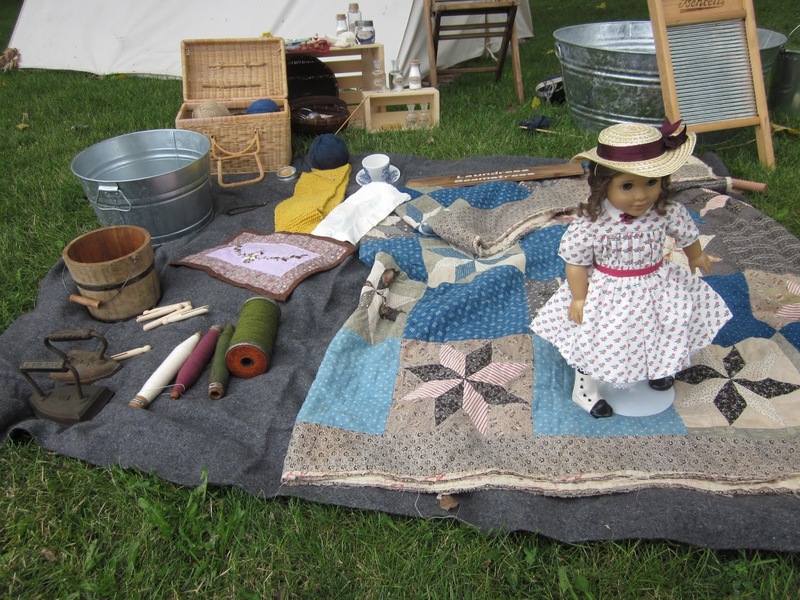 There wasn’t very much fabric to go around, just as, there wasn’t very much of anything to go around in the soldiers camps, so women would use all sorts of odd fabrics to make the quilt itself, and the batting! This quilt is so old it has some damage to it, and you can see the batting was actually another quilt! 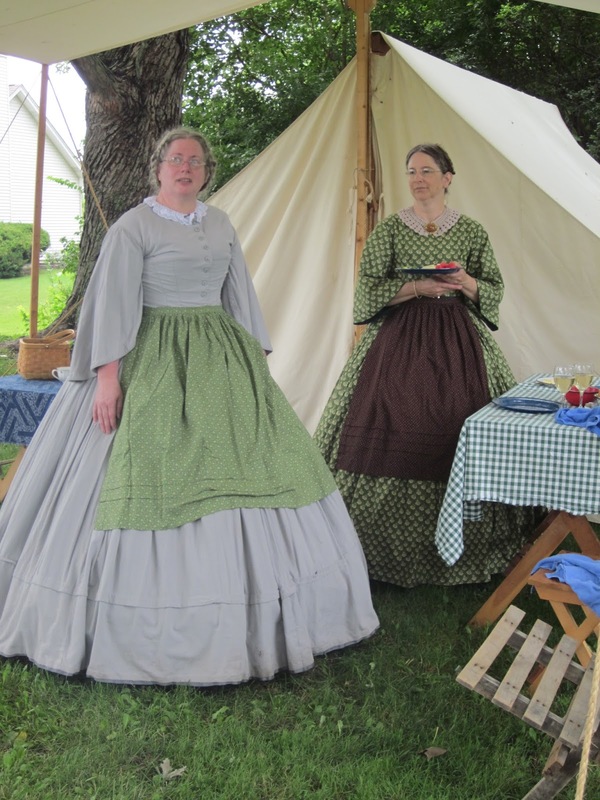 Laundresses were constantly knitting, sewing, and ironing for the soldiers. The irons were SO heavy, and they had to use whatever they could find for an ironing board since they couldn’t possibly carry one around while traveling! The soldiers wore wool uniforms all the time. They were overdressed during the summer, and underdressed in the winter. But although, cotton was available, wool was better because when it got wet, it would still keep the soldiers warm. Oftentimes, the wagons carrying supplies and tents would arrive very late, so soldiers set up what are called dog tents. Little tents they could sleep in. Each soldier was issued one pole, and one sheet, so they had to buddy up with someone else if they wanted to make a tent. They slept on a rubberized wool tarp thing, that kept out moisture. 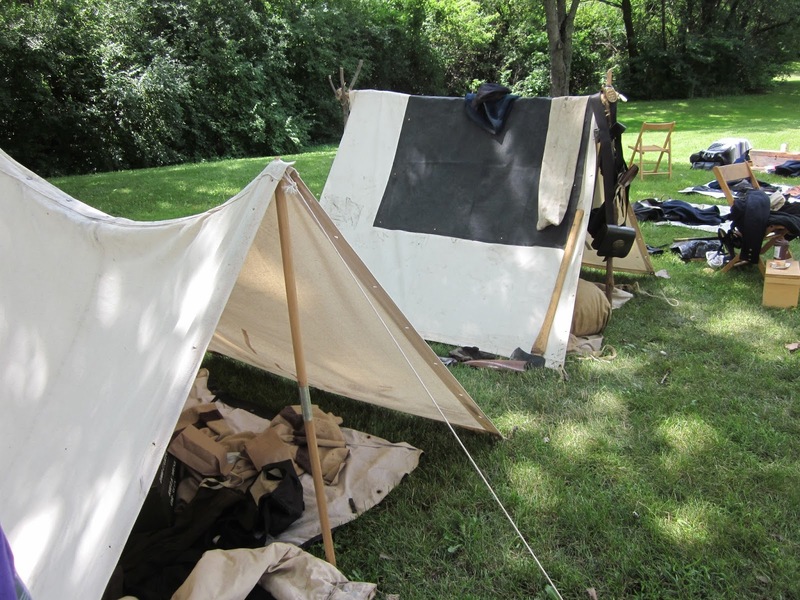 And yes, these tents you see here, were really and truly slept in by these volunteer reenacters! 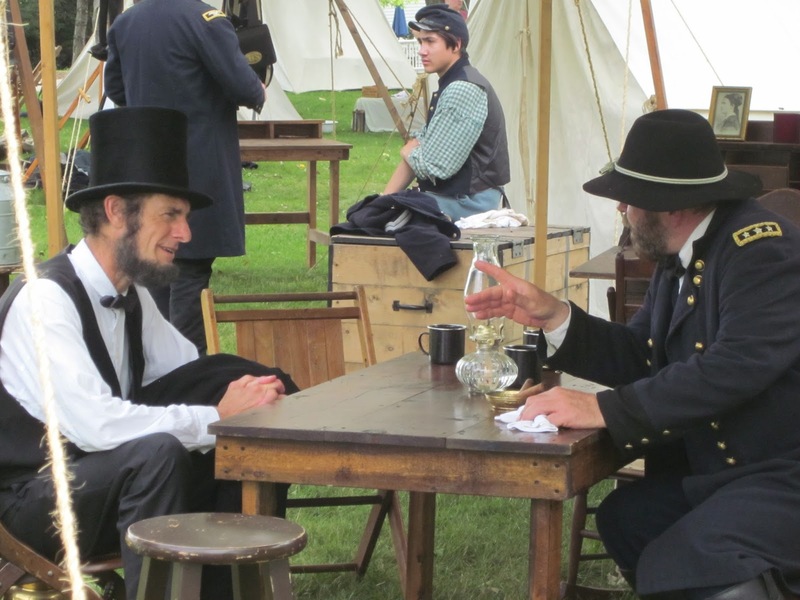 They could choose to either sleep in a hotel (some of these people came from very far away), or they could fully immerse themselves in the 1860s and sleep like the soldiers really did! 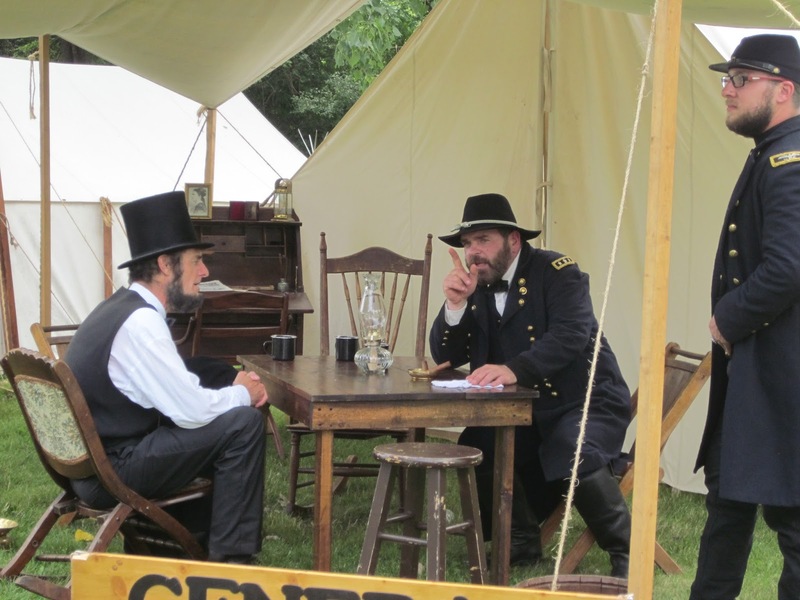 We walked out of the dog tents and were surprised to find President Lincoln and General Grant talking about the upcoming battle! 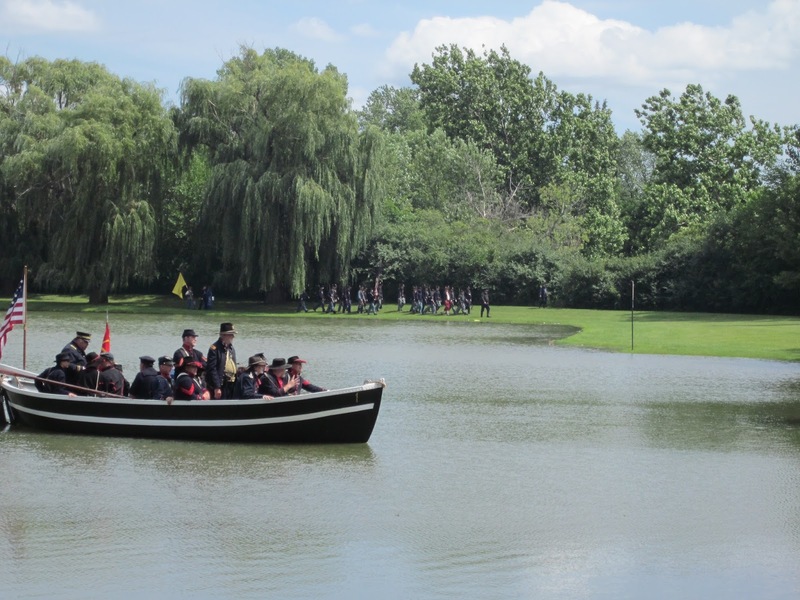 The big battle started with the Union navy travelling up the lake and onto the shore. Creeping as quietly as they could. 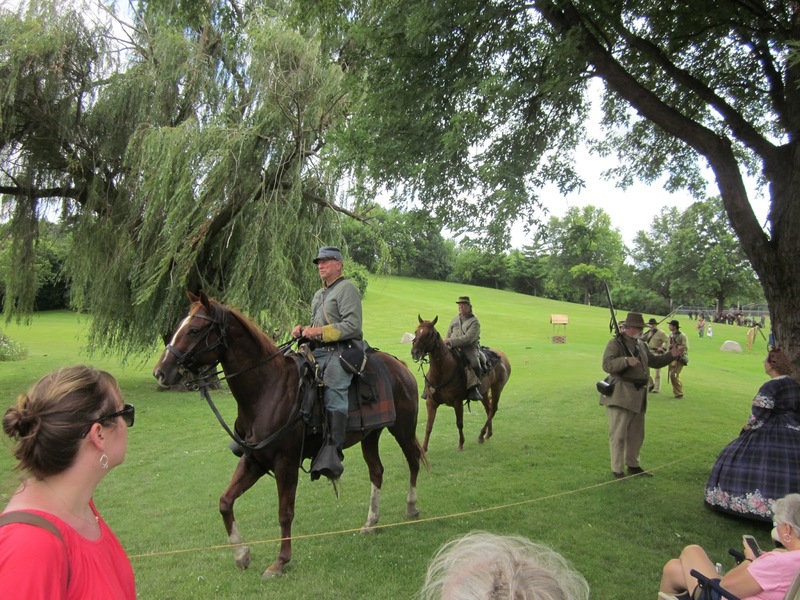 But the Confederate cavalry had already been tipped off and were waiting for them. 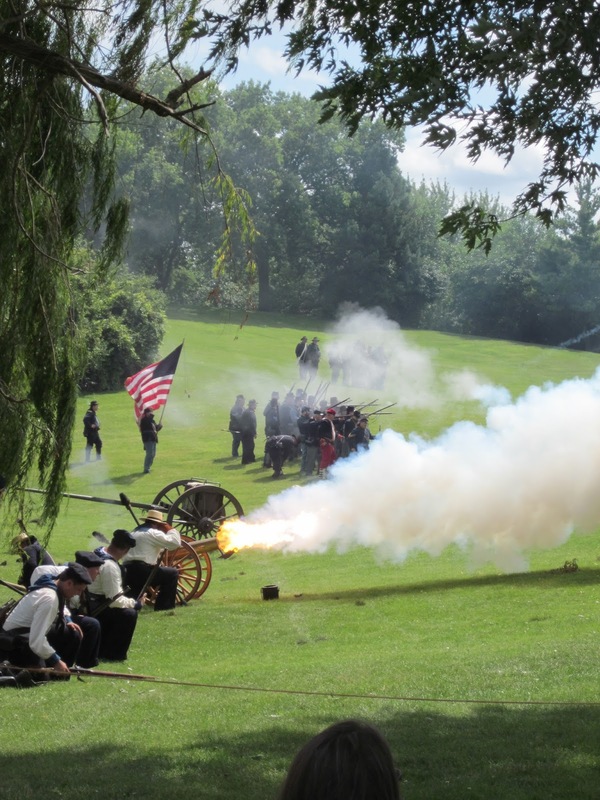 I’ve been to Colonial Williamsburg and have seen cannons go off there, but here, it was much scarier, and much louder. We learned from a Continental Army soldier that although the Colonial Williamsburg cannons can take 16 kg of gunpowder, only 12 is used for the public demonstrations. 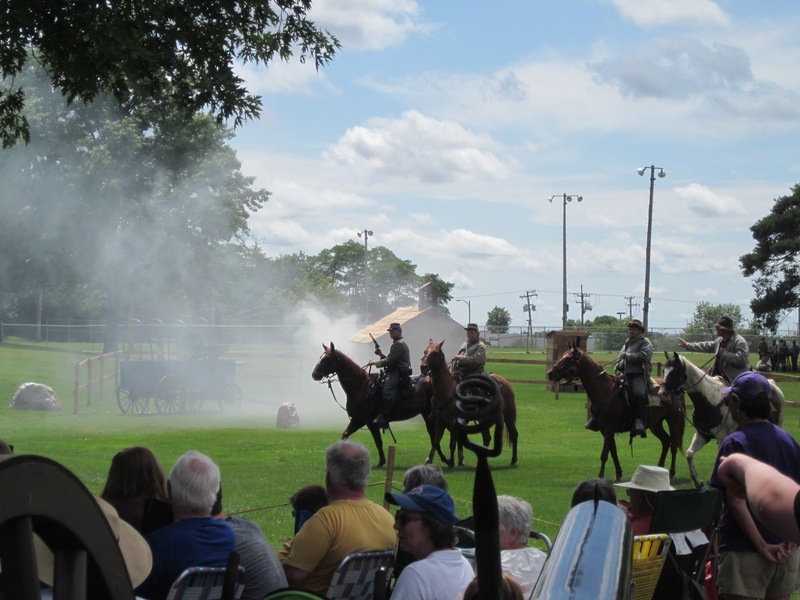 My mom and I thought there must have been 16 kg used for this Civil War battle because it was SO loud, and you could see the fireball coming out of the cannons when they were fired. What made it even scarier, was that something (I don’t think it was an actual cannon ball) would hit the ground causing piles of dirt, grass, and debris to fly hundreds of feet up in the air and come crashing down! 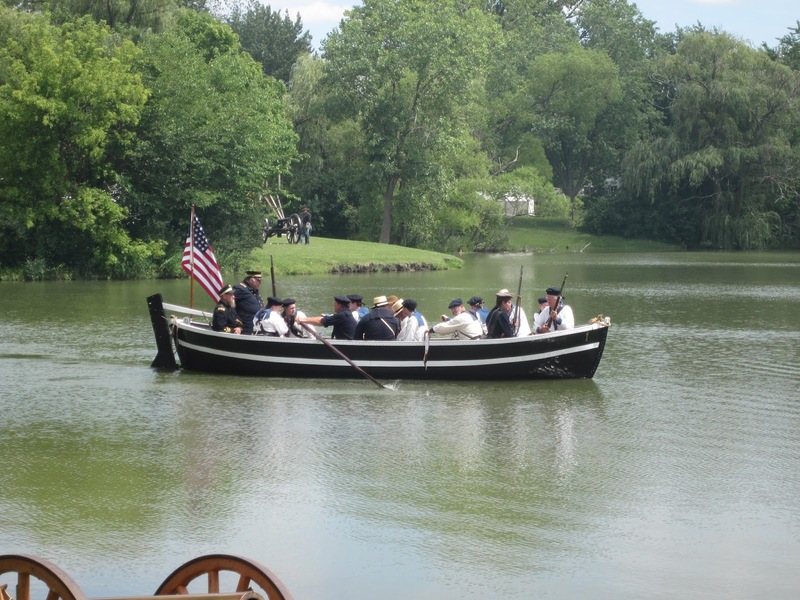 Another ship arrived carrying more ammunition and more soldiers for the Union army. 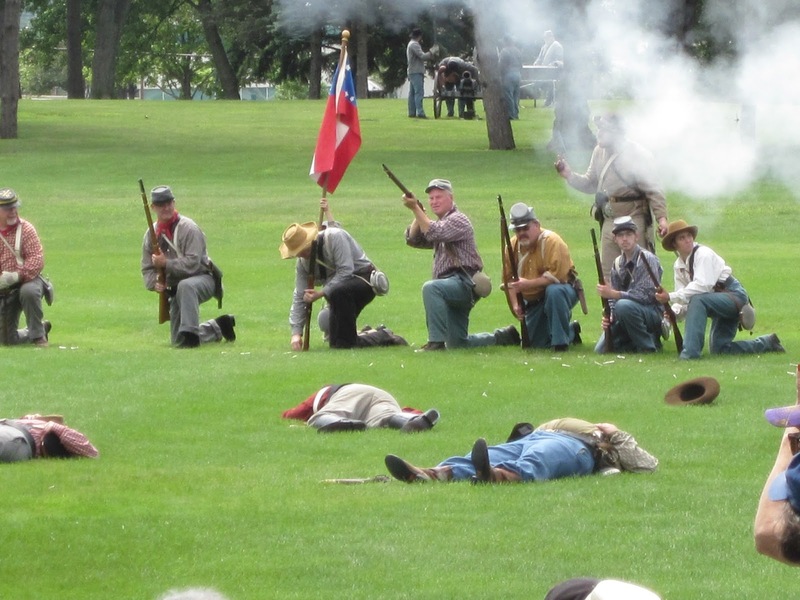 Many Confederate soldiers lay dead on the hot field. The whole time this was going on, an MC was describing what was happening. He made it really fun, often telling jokes and making it really exciting, until, towards the end of the battle, a soldier really did pass out, or got injured, I wasn’t sure exactly, because it was far away and I couldn’t see. But the MC yelled, “This is serious! We need real medical help! A soldier is really down!” and a man from the audience (guessed he was a doctor) ran over to the guy who was down, and after a while an ambulance came. 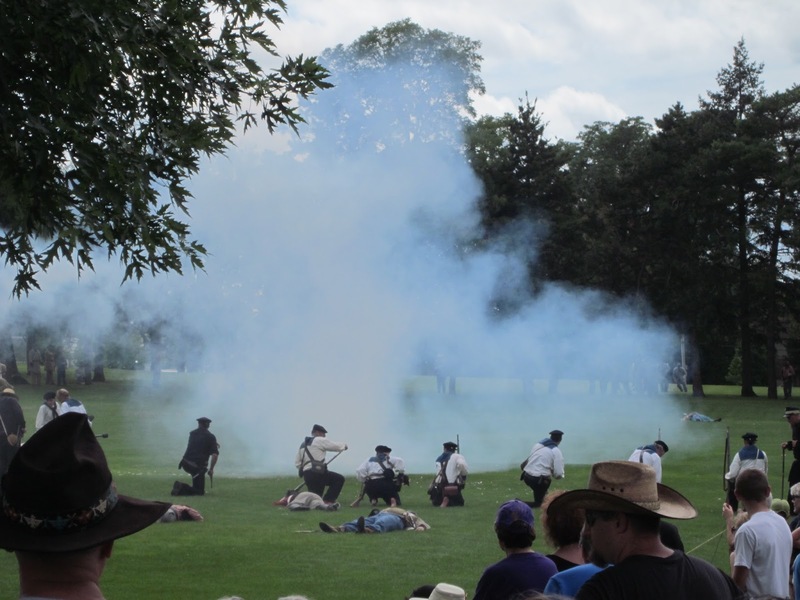 All while this was happening, the battle ended and the Union soldiers won the day! If we thought this was the best part of the whole day, we were wrong! 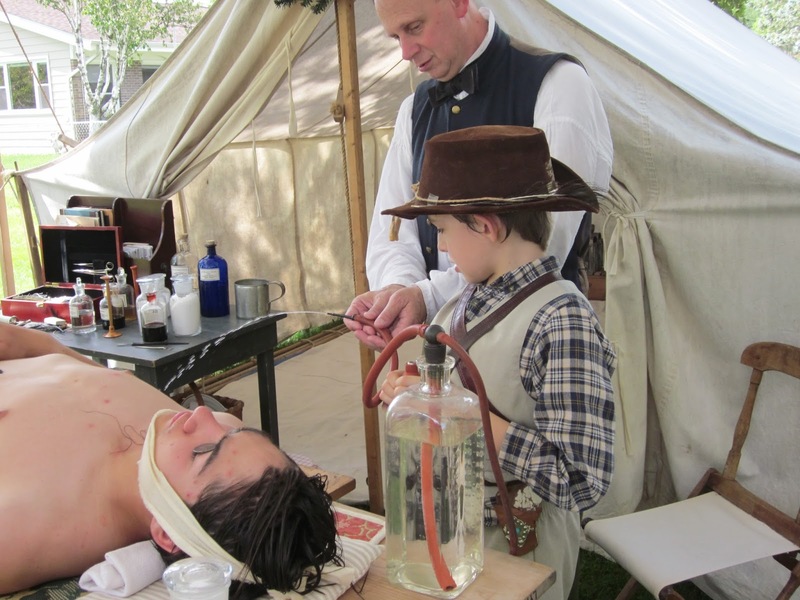 Because afterwards, we went to the undertaker/embalmer’s tent and got to learn what they did with the dead soldiers. If you are at all squeamish about death and guts and blood, I’d advise you to read no further! I have a somewhat morbid curiosity about death (I’ve read too many ghost stories when I was a kid! ), so learning about this was SUPER interesting to me. Whenever an undertaker received a body, they had to be ABSOLUTELY CERTAIN the soldier was dead. So they had many ways of testing this. They listened to the heart with a sort of stethoscope (I can’t remember what it was called) to see if they could hear a heartbeat. They would hold a feather or a mirror up to the nose/mouth and if the mirror fogged up, or the feather fluttered, the person was alive. If you are dead, your eyes and mouth will open due to the muscles relaxing (actually, if you want to hear something really creepy, your eyes go flat when you die, no more round eyeballs! ), so the undertaker will put silver dollars on the eyes and band the mouth shut until rigor mortis sets in. Did you know, rigor mortis only lasts for 9-12 hours and then it stops? I had no idea. I also didn’t know that the reason a dead person’s hands are put on their abdomen is to let the fluids/blood flow downward. 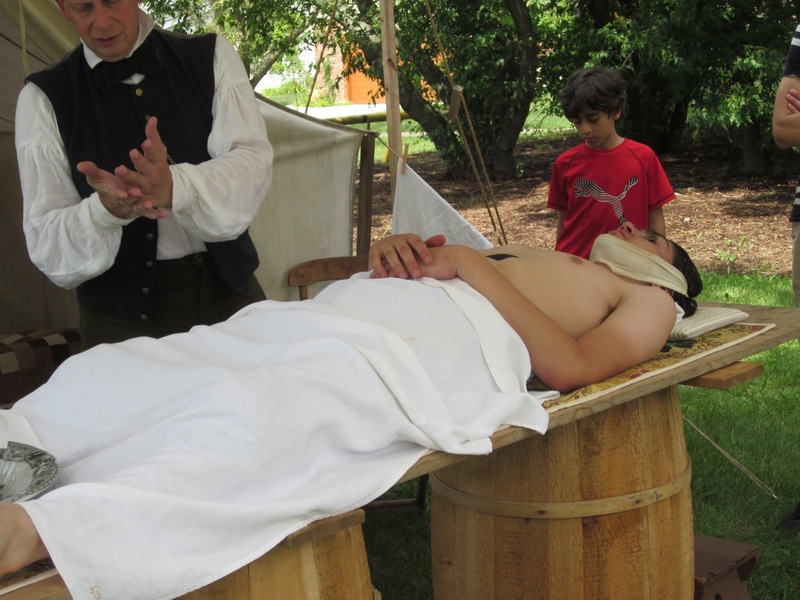 Since there is no blood circulating in a dead body, it pools to wherever gravity is pulling it and leaves a dark coloration of the skin, for example, if a soldier is found dead on his stomach, blood pools and causes his face and upper body to look slightly bluish/purple, which is why undertakers put dead people on their backs. 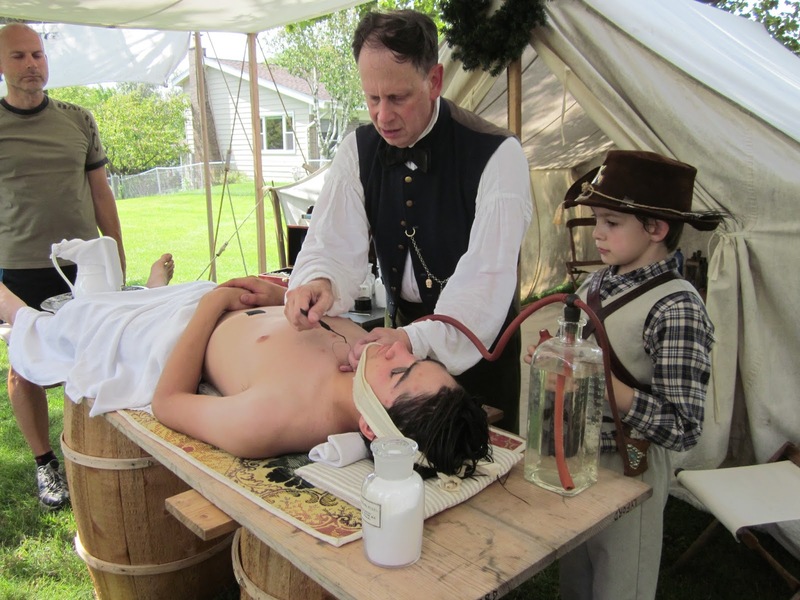 It is not to drain the body of blood, although that did happen to President Lincoln, instead the body is cleaned and injected with embalming fluid using the pump below, and it is worked all throughout the body. The undertaker watches the fingers and toes especially, and when they see the fluid had gone to those extremities, they can stop pumping. Now, of course, this body you see here, is very much alive, so the fluid in the pump was just water! An interesting thing with President Lincoln is that when he was shot, it fractured tissue, muscles, arteries, and bones in his face, so he looked very different when he died. Lincoln’s secretary didn’t want anything done to Lincoln to make him look better, but because he was in full view for twenty some days, they refrigerated his body and they at first had to put make up on his face but because of the blood pooling, his face began to look bruised, purple, blue, shrunken, and quite hideous. So they drained his blood. His body was actually exhumed after 36 yeas because there was a threat of grave robbers and family members wanted to make sure it was really his body. A family member said his face was still recognizable as the president, and even though is tie had turned to dust, the embalming fluids still preserved Lincoln’s body. There wasn’t even that much of a smell either. 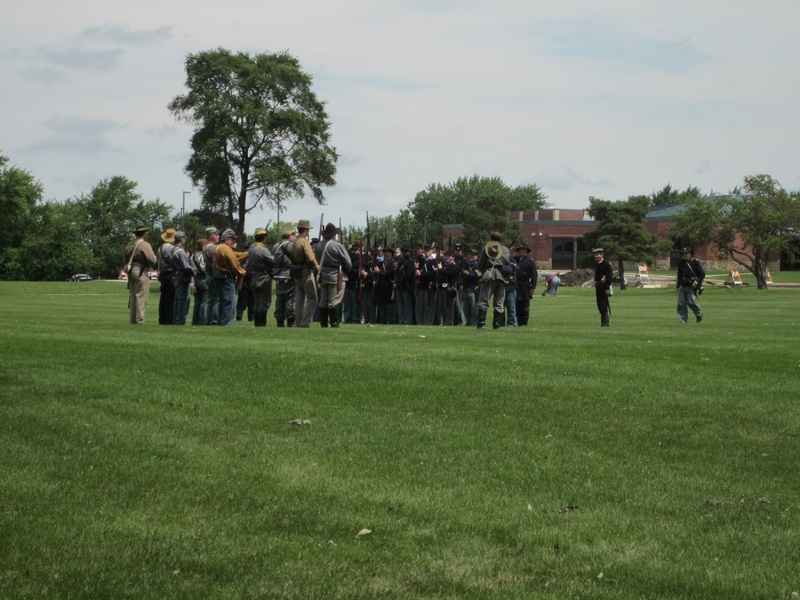 This whole Civil War reenactment was fascinating, creepy, scary, but so well worth going! If you ever get a chance, don’t hesitate to go! You’ll learn so much! More doll travels coming up soon! This. Was. SOOOOO. Interesting! 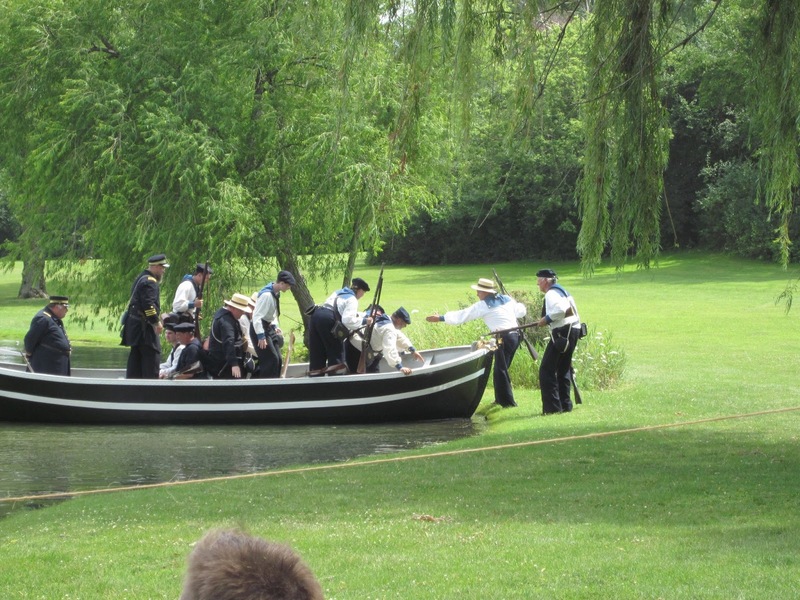 I loved it – this looked like an awesome reenactment. Great to have you back on the blog. Very interesting post! I enjoyed studying the quilt made from a quilt. A very sensible idea that Aunt Millie would approve of for sure. Is that one of Addy’s outfits? It is very beautiful. 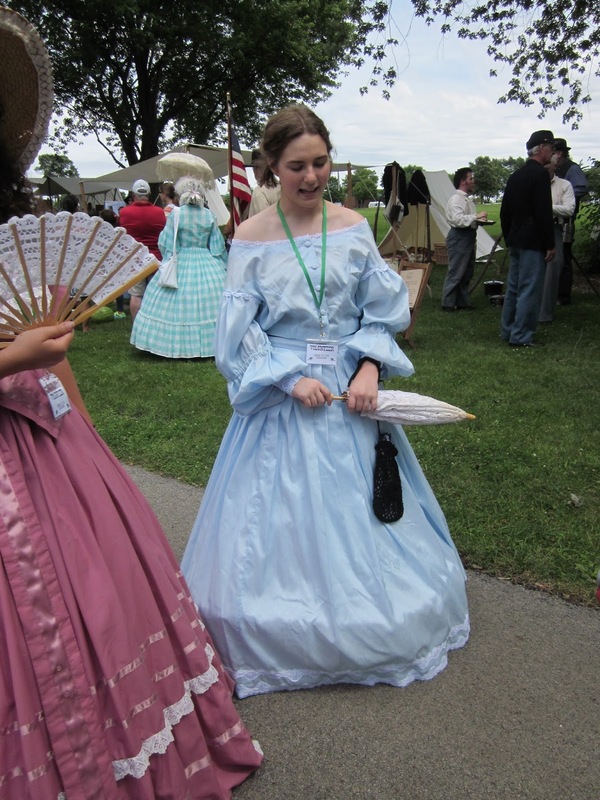 LOVE the ladies’ dresses!! I had never thought about the fact that it could be difficult to determine death without our modern technology. Eeek! Yes, Marie Grace is wearing Addy’s summer dress from Saves the Day. I added a Magic Attic petticoat to make it flounce out like that. 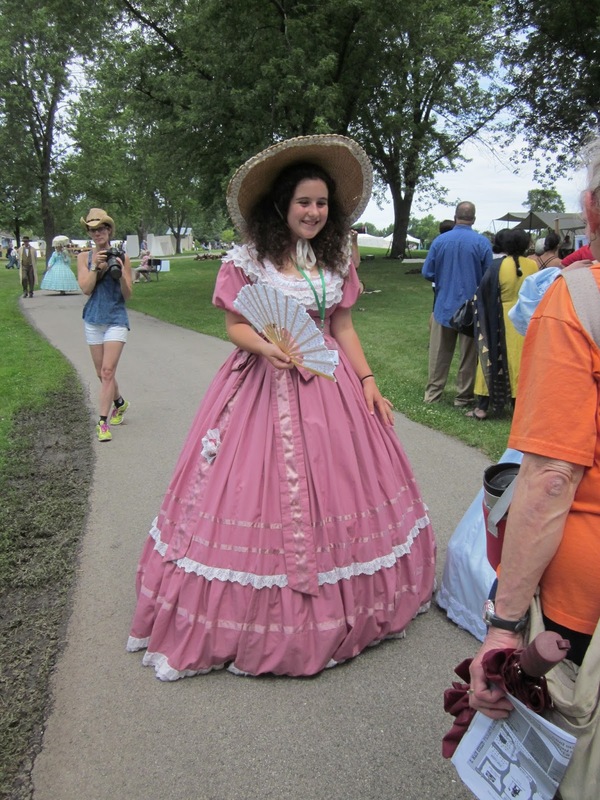 The petticoat adds a lovely effect! Very interesting! I love all the costumes. Hee! Yeah, everyone listening to him was just riveted!